One of the roles we fulfil at Skipedia is monitoring social media for our clients. All companies should be monitoring for brand mentions, but sometimes it’s also worth following, or starting, a particular conversation. 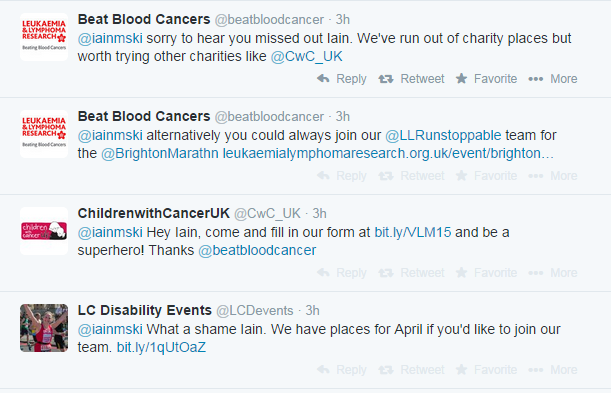 Within twenty minutes, I received replies from three charities – Leukaemia & Lymphoma Research, Children With Cancer & Leonard Cheshire Disability – monitoring the #londonmarathon hashtag, suggesting I could take one of their charity places. Leukaemia & Lymphoma Research win extra points for noticing where I live and suggesting I enter the Brighton Marathon (as it goes, I already have a place, but if I do decide to fundraise, they are now top of my list).